A seizure is a sudden surge of electrical activity in the brain. This happens due to complex chemical changes that occur in nerve cells. Brain cells stop or excite other brain cells from sending messages. Many times it is associated with person’s body shake that can be rapid and uncontrollable. This is what convulsions is. Epilepsy is a condition where seizures recur due to a certain condition of the brain. 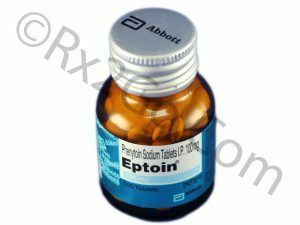 Phenytoin sodium tablets helps to prevent and control certain type of seizures. It is an anticonvulsant or anti-epileptic drug. It is on the WHO’s list of essential medicines. How does Phenytoin sodium work? Phenytoin sodium is in a class of medications called as an anticonvulsant. It helps to control seizures. The drug works by decreasing the abnormal electrical activity in the brain. It slows down the impulse in the brain responsible for seizures. It dampens unwanted abnormal brain activity and reduces electrical conductance among the brain cells. This limits the spread of seizure activity. What are the uses of Phenytoin sodium? It helpful to prevent and control the following conditions. How to take phenytoin sodium? It is available in the form of tablets of 50 mg and 100 mg. The dose depends on certain conditions. Your age to take the medicine. The condition that is being treated. How is your reaction to the first dose? Your dose will depend on what type of disease you have as discussed above. The maximum dose is 300-400 mg/day. Your Doctor may increase it up to 600 mg/day if needed. What are the precautions in taking Phenytoin sodium? It is sensible to limit the use of this drug in pregnancy and breastfeeding. The active ingredient in both generic and brand phenytoin sodium is the same. Their effect remains the same. The difference is the price of the two. The brand versions are costlier due to their packaging, pricing and brand name. But the generic drug doesn’t include these prices. There is no such investment in the research and development of generic medicines. We apply other cost-cutting measures. All these saving is passed on to our customers to give cheap generic medicines. Cost of Generic phenytoin sodium. Pack of 90 tablets of 50 mg costs $ 20.99, per unit cost is $ 0.21. Pack of 90 tablets of 100 mg costs $ 25.99, per unit cost is $ 0.26. Pack of 90 tablets of 50 mg costs $ 107.86, per unit cost is $ 1.19.